Lecturers were hit with more bad news today when UNZA management announced that there was no hope they would receive their delayed March salaries this week. 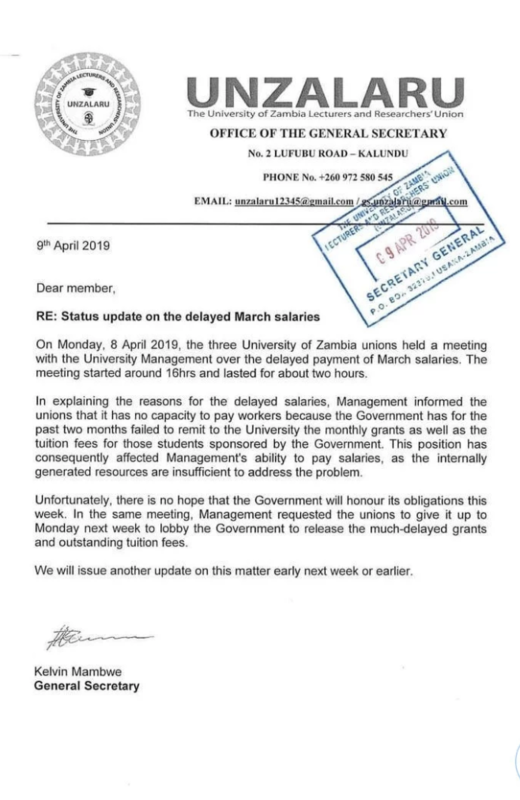 A memo issued by UNZALARU noted that management had held a meeting with three UNZA unions over the delayed salaries, they informed the Unions that the reason they could not pay staff was because the government had failed to remit to the University the monthly grants as well as the tuition fees for students sponsored by the government. The University Management insists it has been put in this position directly by the government and they are unable to pay the salaries until Government sends them sufficient funds. However, the General Secretary Kelvin Mambwe noted that there was little hope the government would honour its obligations any time soon – leaving the university, its staff and students in a state of chaos.